The word periodontal literally means “around the tooth.” Periodontal disease is a serious infection that affects the tissue surrounding the teeth. These tissues include both the gums and the bone that support the teeth. Periodontal disease is known as the “Silent Disease.” It is typically a painless, progressive disease. 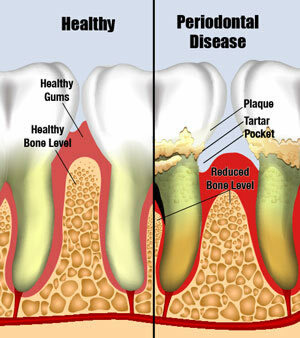 Most adults with periodontal disease are unaware they have it until it is in an advanced stage. A periodontist is a dental specialist who treats periodontal disease. We are experts in the supporting structures of the teeth. A periodontist places emphasis on prevention. It is the periodontist’s responsibility to recognize disease, determine if it is advancing, and then stop its progression so you don’t lose your teeth. When you have an periodontal infection bone is actively being destroyed, it is therefore very important that you contact us without delay to schedule a comprehensive evaluation. We will be able to determine the treatment necessary to control your periodontal infection and set you on a path toward excellent oral health.